It’s been a stressful week or so. I was fully ensconced in a week-long photoshoot, which I enjoyed but the hours take its toll on one’s soul. I ran a half marathon, which also takes its toll. The pollen count in Atlanta has been in the upper 5,000 range – try to fathom swirling masses of pollen that look like snow. My cat knocked my camera off the desk and now the battery flap won’t stay shut. Imagine how fun it must be to try to be Richard Avedon while holding the bottom of the camera shut with ones thumb. Needless to say, there’s been very little time for cooking beyond boiling water and dumping sauce on pasta – I think I had only a glass of wine for dinner two nights last week. Now that the chaos has subsided, I am yearning for comfort food. Nothing revives my constitution like matzoh ball soup – a timely craving, don’t you think? My whole life, it was the cure for whatever ails you. Sniffles? Sinuses? Sore Throat? You bet. One bowl of my mom’s matzoh ball soup and you were right as rain. Since it worked on all of those, it’s bound to be a remedy for a light case of Sorta-Stressed-Out. For my version, I added fresh herbs to my matzoh ball mix. I had fresh chives, tarragon, and Italian parsley on hand…so in they went. I prefer my soup very simple – just great stock and perfectly cooked matzoh balls. Maybe it’s superstition or silliness, but I never peek under the lid while they’re cooking. When you do lift the lid on this soup, just inhale the herb-filled steam and start feeling better instantly. – In a large bowl, mix the matzoh meal, salt, and pepper. In a medium bowl, whisk together the eggs, oil, water, and herbs. Add the matzoh mixture and blend well. Cover and refrigerate for 15-20 minutes. – Bring a large pot of water to a rolling boil. 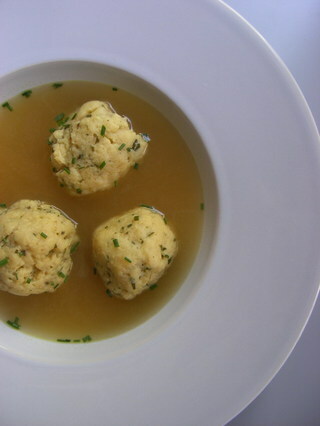 Shape matzoh balls and drop into boiling water. Reduce to a simmer and cover. Cook for 30-40 minutes. That is absolutely one of my favourite things! I’m a big fan of fresh herbs in it as well. Hope you’re able to get a little downtime soon! There’s one big improvement you can make to your matzoh balls: use schmalz instead of oil! Hey congrats on the half! Soup is good food. I heard that somewhere. Anytime something has happened to one of my cameras, it feels like a personal injury. Hope the soup helped. 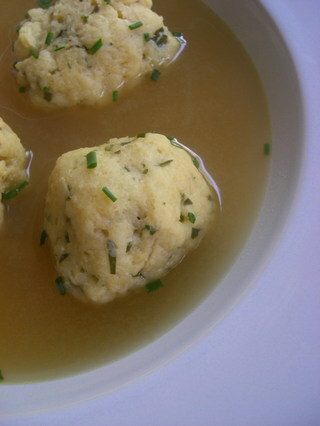 You talked about the yummy sounding matzoh balls [the fresh herbs are an excellent addition]–tell us about your stock.